Photo Contributed by Lisa Waites A SHARED PASSION: St. Andrew's United Church hosted the community knitting group on Nov. 28. 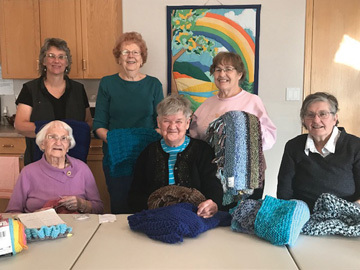 A group of avid knitters and crocheters meet every week at St. Andrew’s United Church to create a number of goods to give back to the community. “The group meets every Wednesday from about 9:30-11:30 a.m. mostly at our meeting room at the church — the first Wednesday of the month they meet at the Pleasant View Lodge,” said St. Andrew’s minister Lisa Waites, who added that the church does not organize the group — they just offer a place to get some work done. “The group is made up of a number of congregats from our church and I know there’s some from other churches as well — there’s a number of community members who come out as well. Waites says there are a number of uses for the things created by the group. A member of the group also works on jean quilts and donates them to the local women’s shelter when they’re completed. Waites says the group has been working on creating these various items for a number of years and has created far more than 1,000 pieces in that time. Waites says this is a very important group within the community.